I’ve sought long and hard for an answer to the question: How to save money on textbooks? According to a report conducted by U.S. News, college students are spending around $1,200 each year on textbooks. I don’t know about you, but that cost doesn’t excite me. If you consider the fact that it takes approximately four years to complete a bachelor’s degree, then a college student at a four-year school could easily rack up $4,800 in textbooks costs alone. Thankfully, I’ve found six great websites that will help me show you how to save money on textbooks! The extra bonus is that several of these sites have partnered with Ebates, which means you get cash back AND save money on your books! Disclosure: This article contains some affiliate and referral links, meaning I will receive a commission of any sales (at no cost to you). 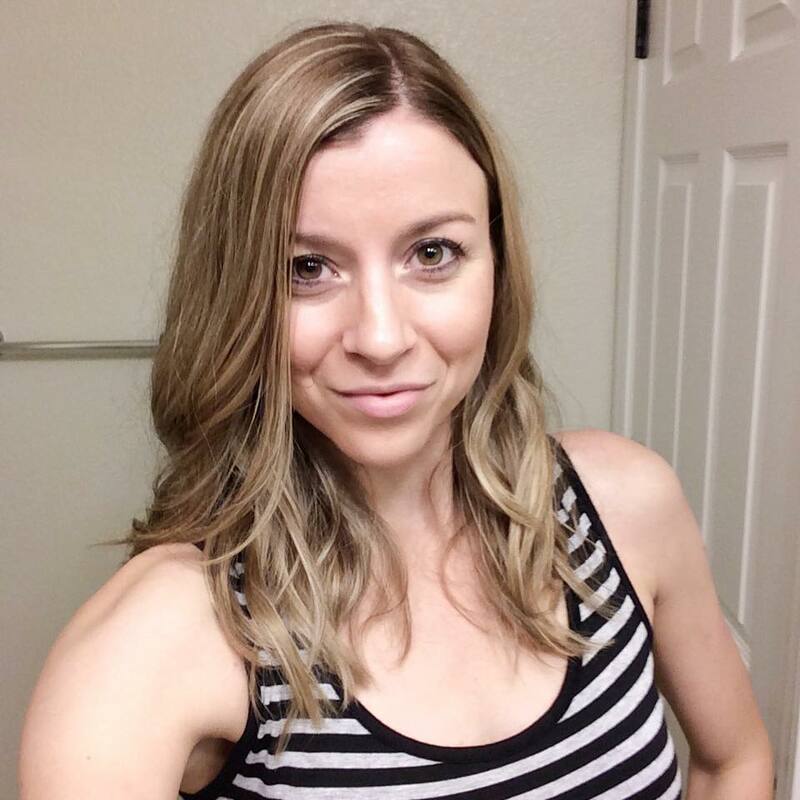 Thank you for supporting Chase the Write Dream! I honestly wish I had known about how to save money on textbooks before I graduated from my bachelor’s degree program. I ended up buying my books through my school’s bookstore every year, so you can only imagine how high my costs were (yes, it was in the thousands, even with used materials). When I enrolled in my master’s degree program back in 2013, I made a vow that I would find a better way to pay for my college textbooks. 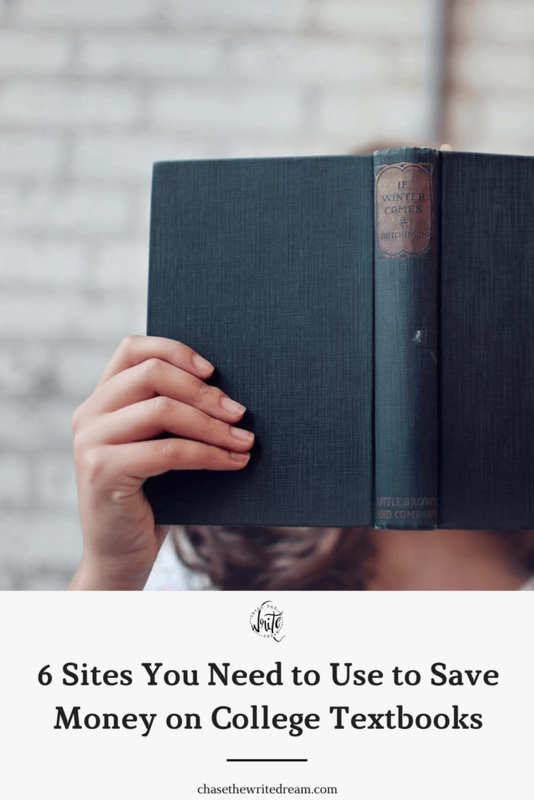 I began researching the internet like crazy and did cost-comparisons to decide whether I should invest in a tablet or continue to utilize physical books. For me, buying a Kindle Fire HD came out to be the best option because I didn’t mind reading ebooks and I found that I could save a lot of money by renting college textbooks this way. I know that tablets aren’t for everyone, so I’ve compiled a list of six sites that will help you save money on college textbooks. You probably know Amazon as the place to find practically anything and everything in existence, but it might not have been the first thing that popped in your mind when you were trying to figure out how to save money on textbooks. When you consider that fact that almost every book you’ll need is available here (I’ve never had an issue finding one, unless my school was the creator), you’ll come to learn that this site is one of the best places to save money on college textbooks. User Tip: Make sure you search by ISBN rather than title so that you get the exact edition and text that your course requires. So when I took to the internet to find out how to save money on textbooks, I discovered Chegg. With both physical copies and ebooks available, Chegg has all the reading material you’ll need, and it comes with a much cheaper price tag than you would find at your school’s bookstore. With the option to rent or buy, students can decide which option works best for them. If you are just taking an elective course, then maybe renting is your best option; but if you are taking a course for your future career path, it may be worth it to buy the material (only if you think you’ll use it later, though). Chegg brought a happy ending to my story and saved me $40 more than Amazon would have with the same book! This is an AWESOME resource if you want to do a quick price comparison between stores. Simply type in the ISBN, title, or author name, and then conduct your search to see what pops up. When you find you required material, click on it and Textbook Rentals will provide you with the various rental amounts, rental times, and purchasing amounts (new and used) for a variety of stores). So if this site does all the work for you in regards to searching and finding the best offer, then why do you need to know about all these other sites? The answer is simple: the listed prices may not reflect all of the price points available for each text. My recommendation is to find the three best prices listed and then go to those individual sites and do some more digging. Although BookRenter heavily promotes their rental options, you still have the ability to buy from them. This site is the perfect options for students who are taking shorter courses and do not want to have to pay for an entire semester’s worth of college textbooks. This site has a similar rental structure to BookRenter, but it also provides you with a list of sellers who have the book for rent. You will notice that some sellers charge more money than others, even if the rental period is for the same length of time. Although I’m all about getting the best deal, I’ve also heard stories about people getting ripped off on eBay, so I always make sure to read customer reviews and make sure the sellers offer good customer service. If you find that one seller has a really low score, then it’s probably best to pay the few extra dollars to make sure you truly get the material you need and don’t get caught up in a scam. 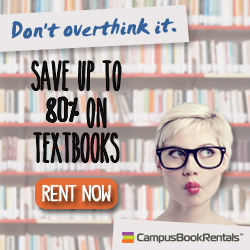 Campusbookrentals.com is another great site that claims to save you up to 80 percent off regular college textbook prices – you can’t beat that! Simply search by author, ISBN, title, or keyword and then find your book! You’ll then be given a variety of rental times to choose from. Simple, easy, and a money saver! One of the biggest concerns I’ve heard about purchasing online is the fact that you won’t have your financial aid money to cover the expenses. 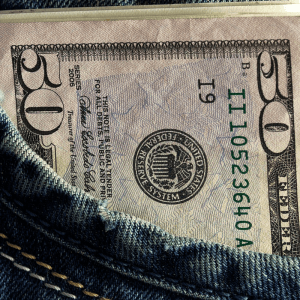 For those of you who don’t get a financial aid refunds, you may want to keep a budget (<— Free Printable Alert) and save money to pay for these expenses. For those of you who do get refunds, you should save that money to use toward future book purchases. Personally, I had to pay out-of-pocket for my first term, but I quickly received my refund just a month later and was able to utilize those funds for the following terms. 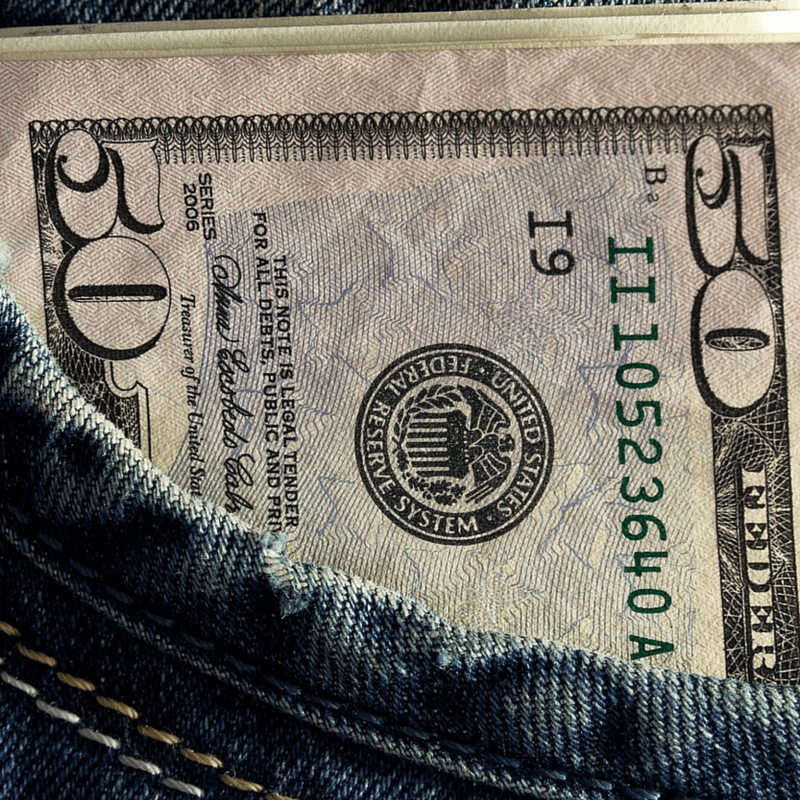 If you attend classes on-campus and are going to be issued a refund, you should be able to go to your school’s finance office or accounts payable office and withdraw money that way – or it should be sent to your home address in the form of a check. Once you get your money, do some research to calculate out how much money you may need to spend on materials for your next term. Once you have that number written down, take that amount out of your refund and set it aside until it’s time to purchase books again. I cringed when I read that you bought all your textbooks from the campus bookstore (ouch!). You definitely have some wonderful resources on where to find cheaper textbooks, but what I do is to confirm on some price comparison website first. These websites usually compare prices for a specific textbook from major online bookstores (like Amazon and Chegg) and quickly tell you the cheapest option without all the hassle of looking it up for yourself. Loved the article, by the way! Thanks for stopping by! I will have to check into those two sites – I always enjoy having more resources on my list! Textbook Rentals does a very similar thing. It’s so nice to have resources like that available so that you don’t have to do all of the groundwork by yourself. I’m glad you enjoyed the article! Addall.com is another great resource — they search across multiple sites like Alibris, Amazon, and Abe Books and rank the results in order from cheapest to most expensive! I have used amazon for most of my books and have found great deals, but have been told by several of my friends to use CHEGG. I also had no idea it existed until I was told about it! Chegg is great! They have been adding tons of great services as well, like tutoring!